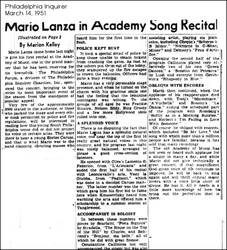 Armando Cesari, Vince di Placido, Lee Ann Cafferata, and Stefanie Walzinger contributed articles to the press sections. 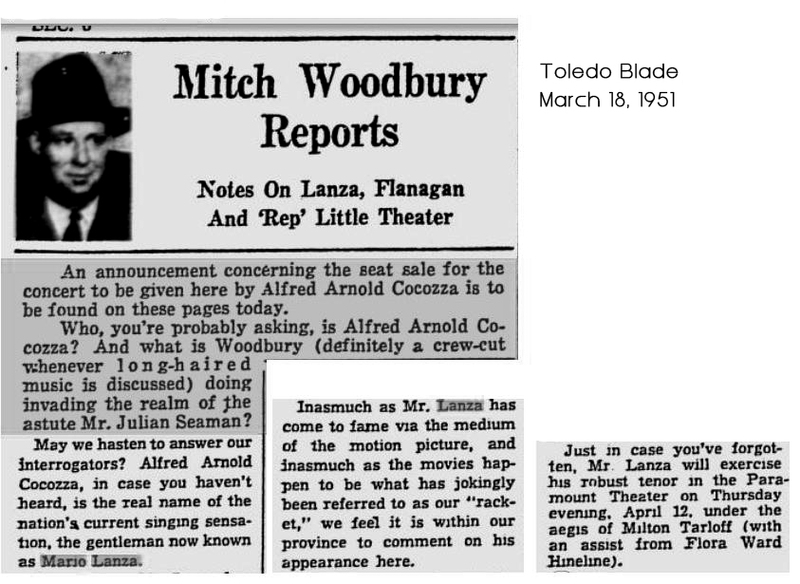 Notes by Derek McGovern. 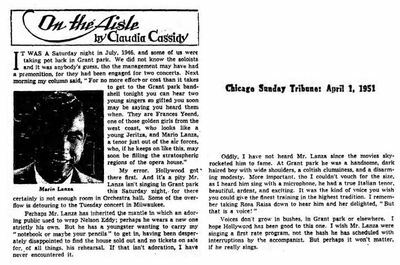 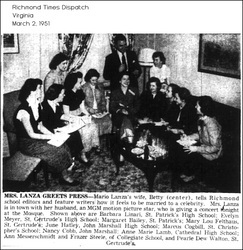 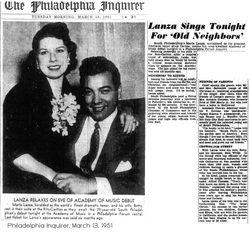 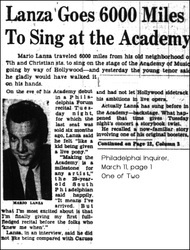 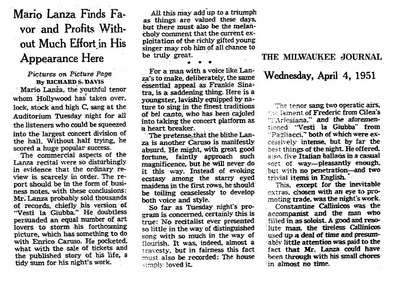 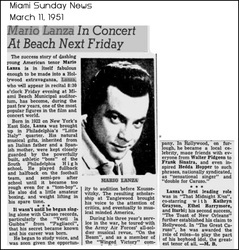 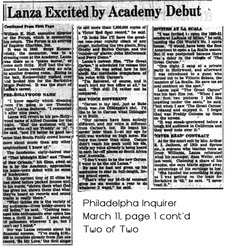 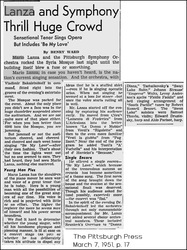 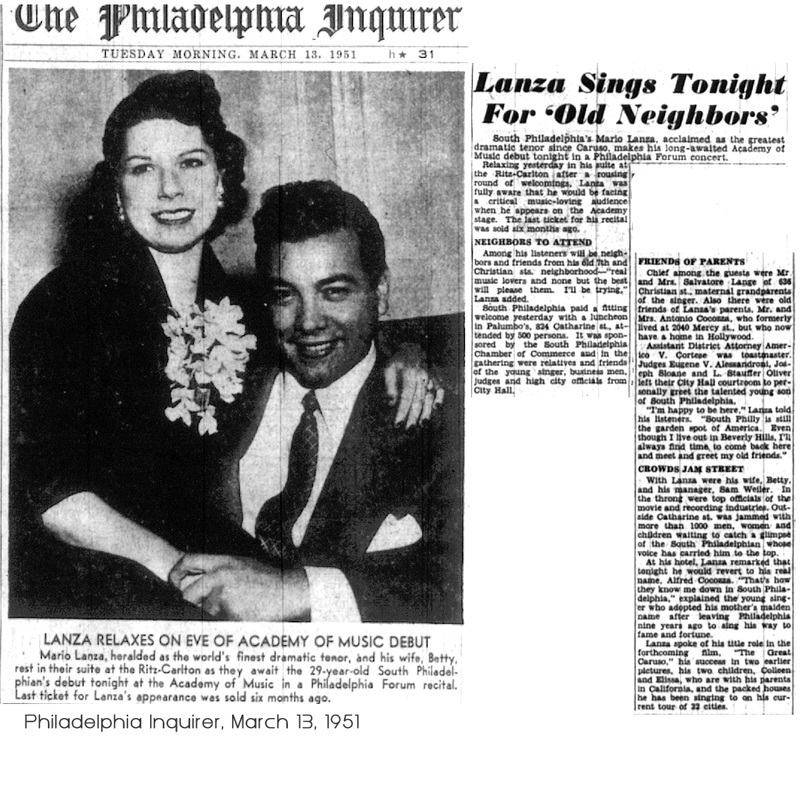 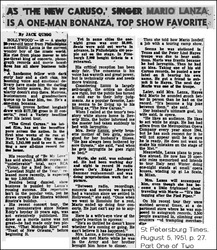 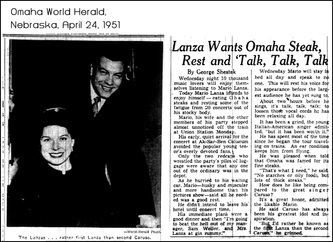 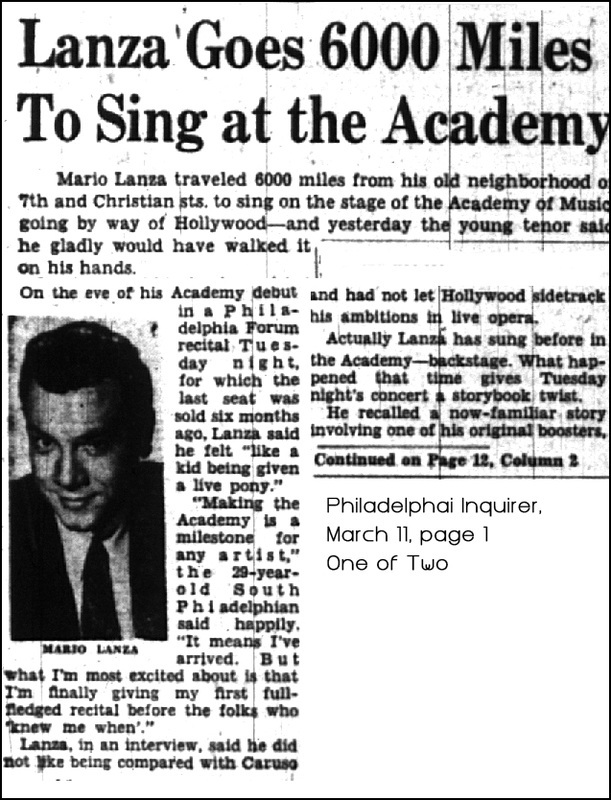 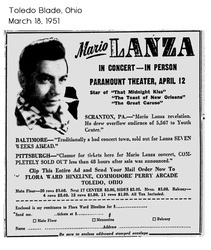 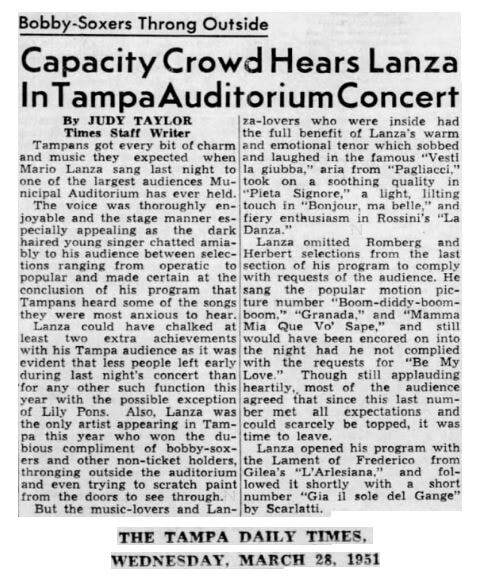 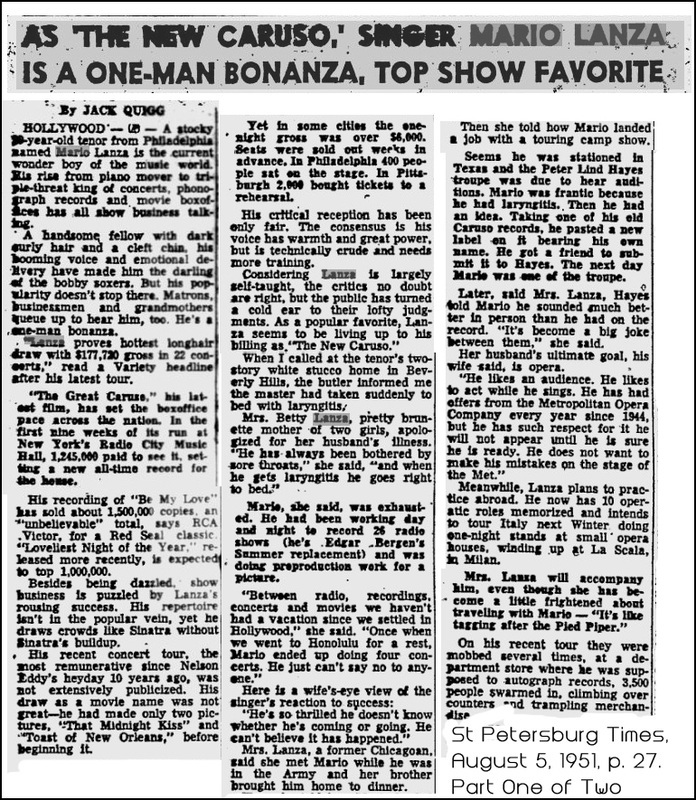 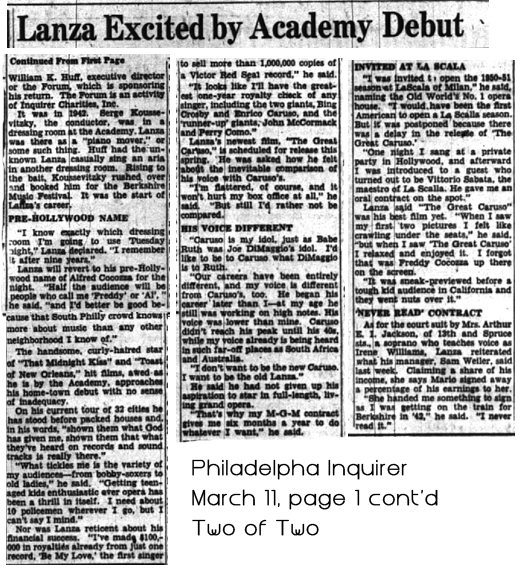 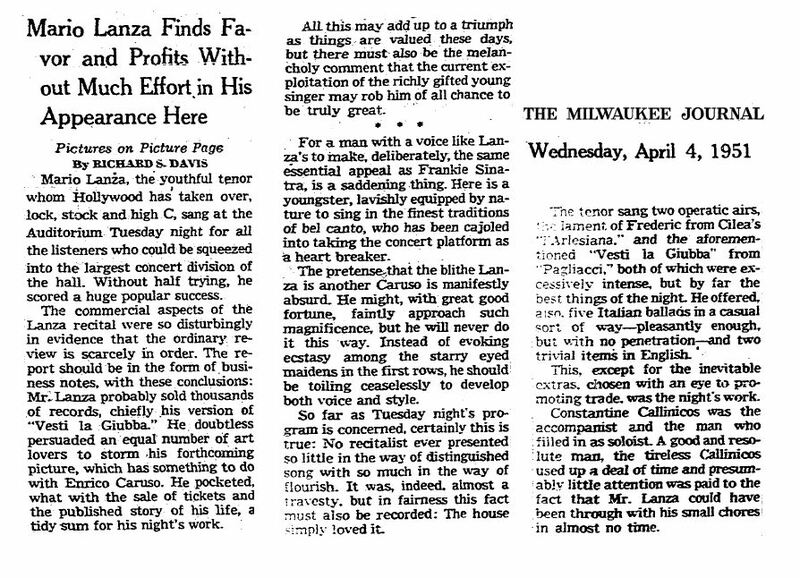 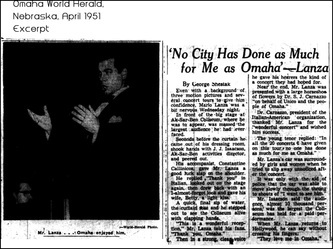 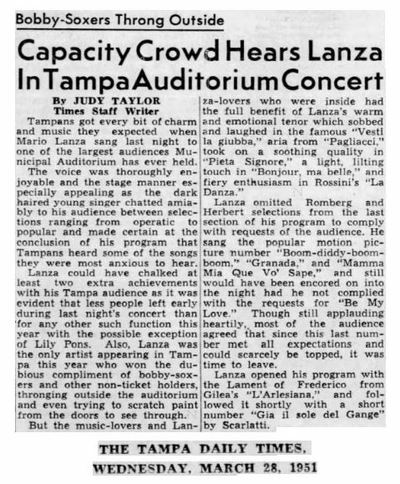 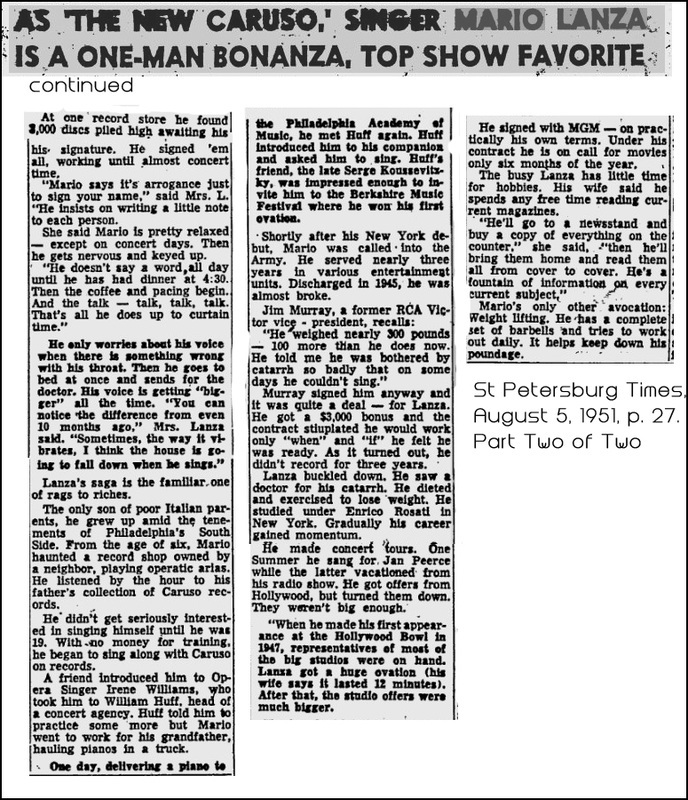 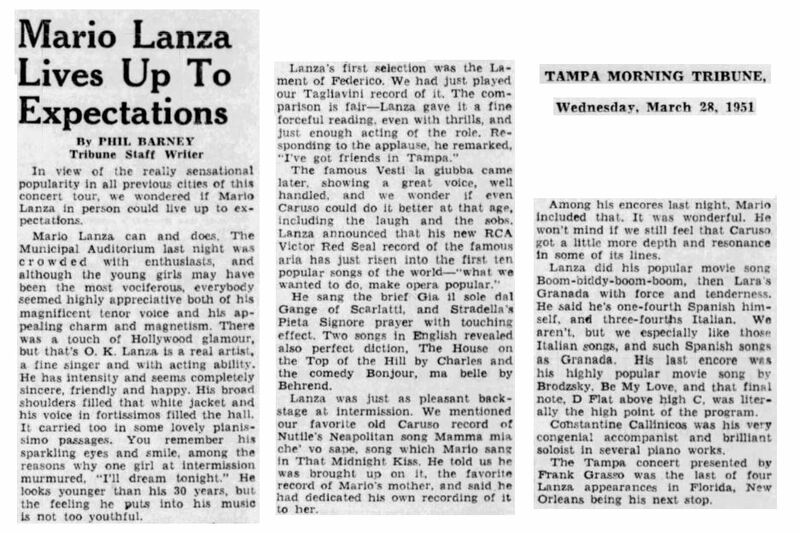 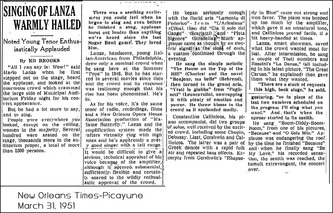 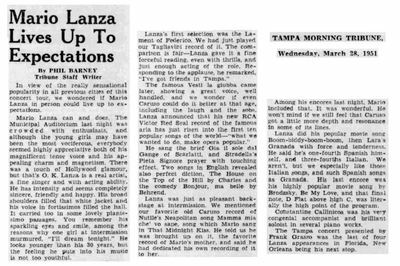 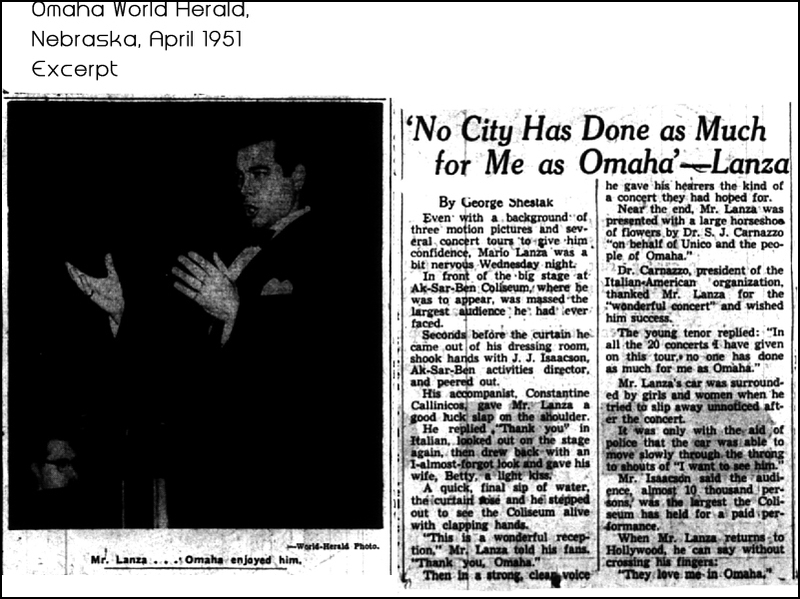 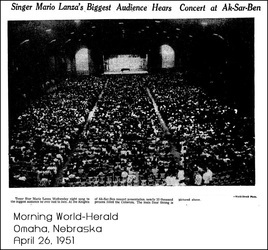 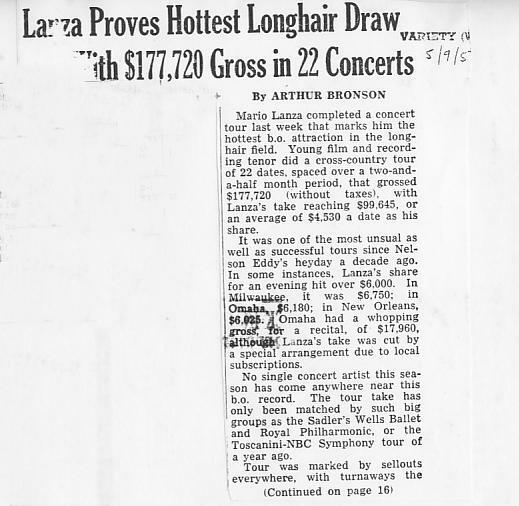 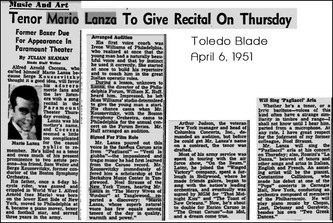 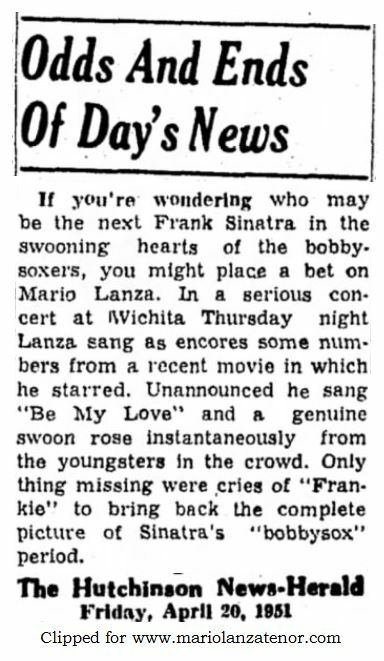 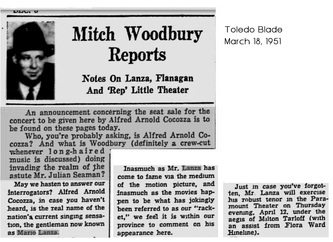 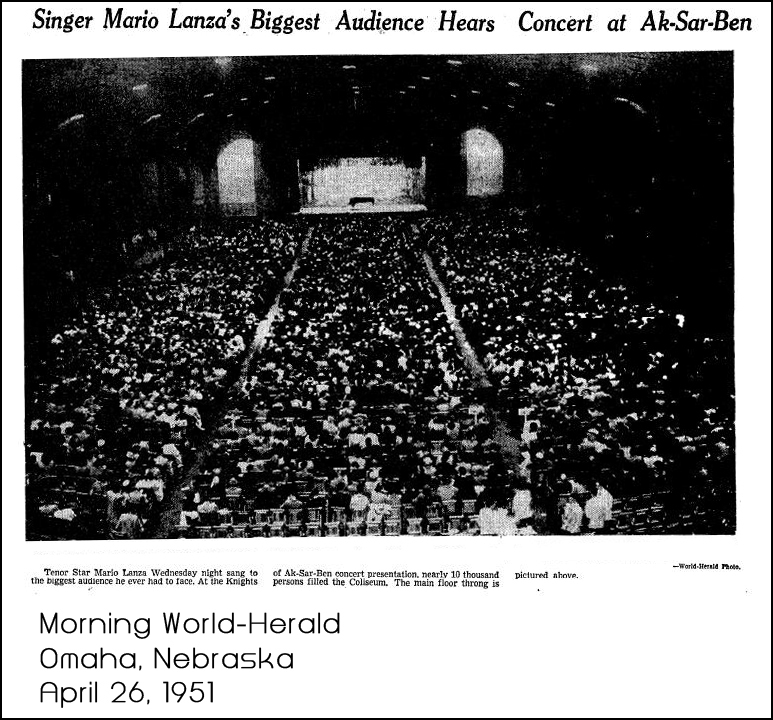 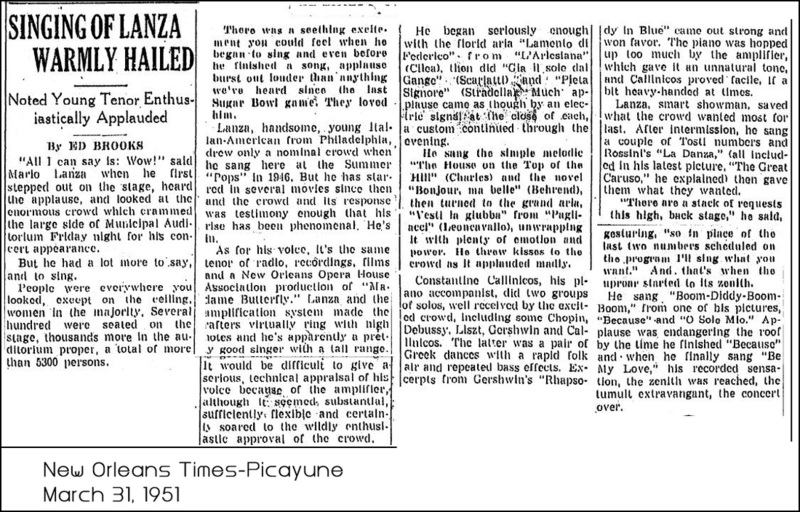 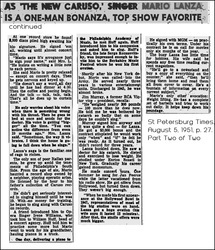 On February 16, 1951, Lanza embarked on a two-and-a-half-month concert tour of the United States, beginning in Scranton, Pennsylvania, and ending in Fresno, California on April 30. 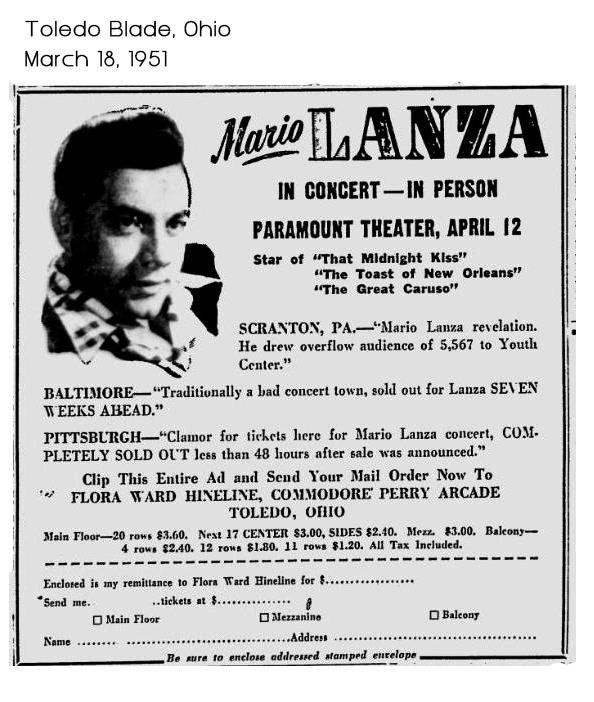 The 22-venue tour included concerts with the Pittsburgh and Cincinnati Symphony Orchestras in addition to recitals with Lanza's regular accompanist, Constantine Callinicos. 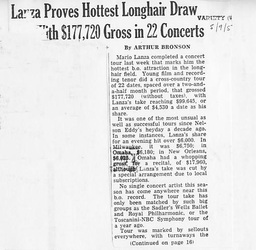 From a financial perspective, the tour was extraordinarily successful, with every venue sold out weeks in advance, often in a matter of hours. 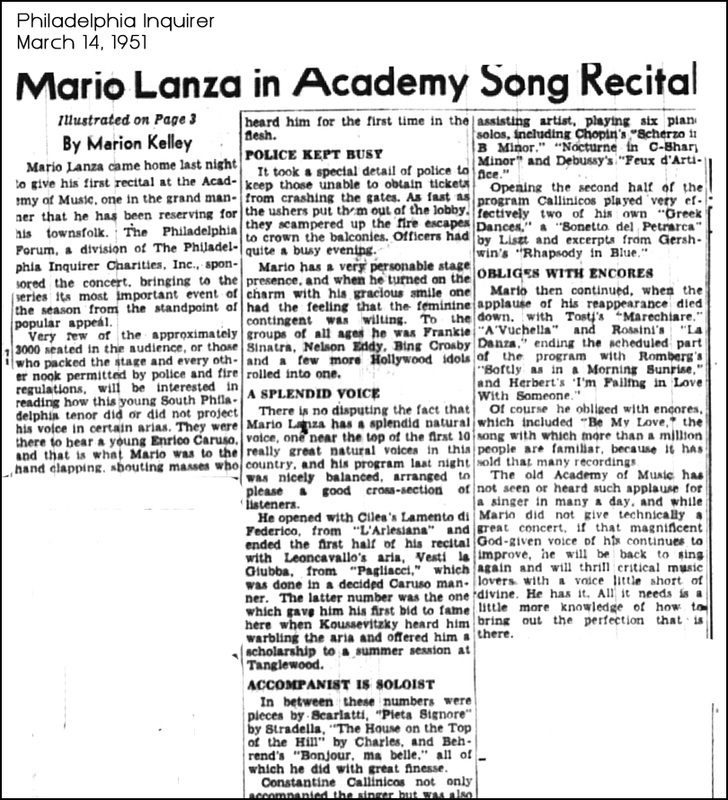 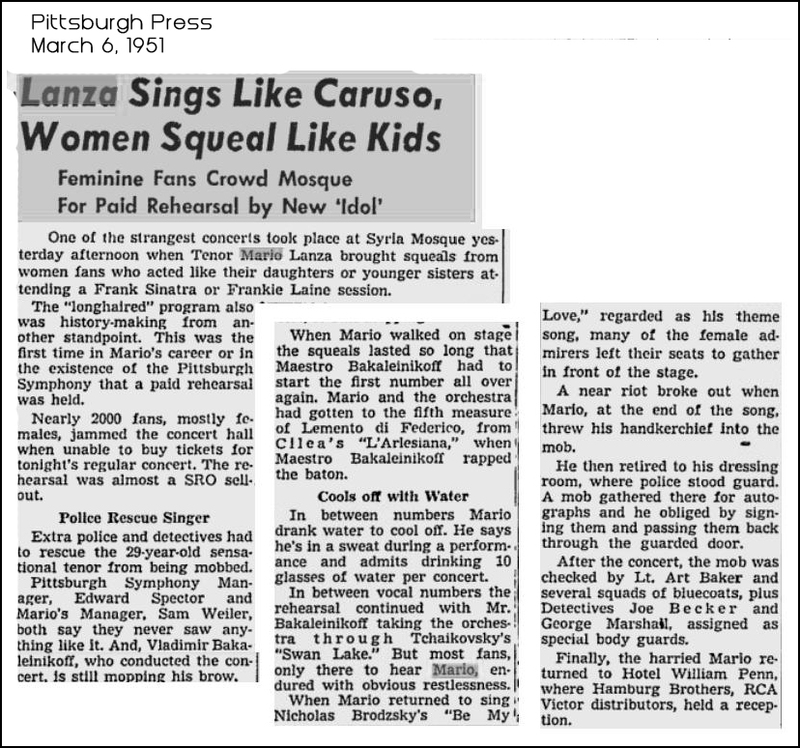 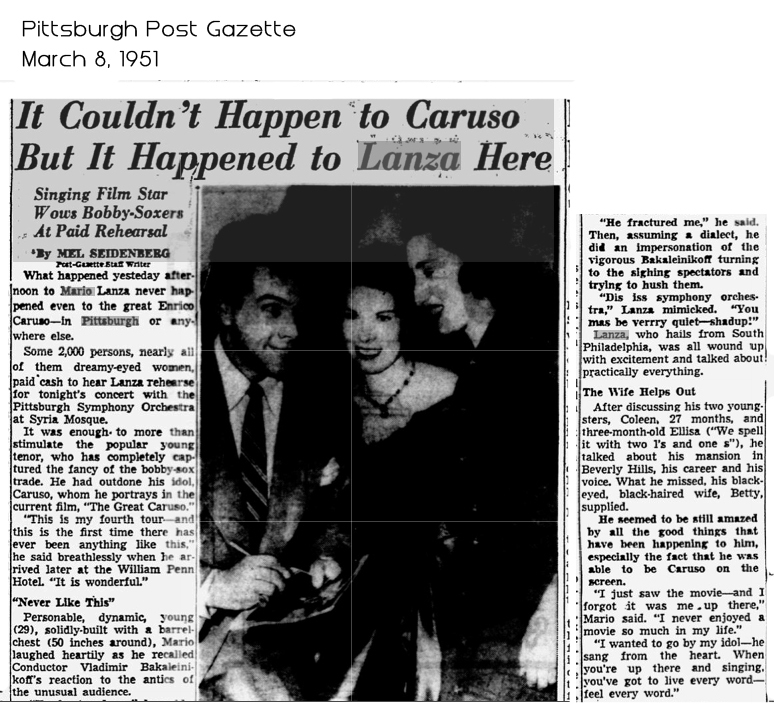 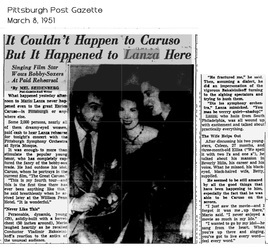 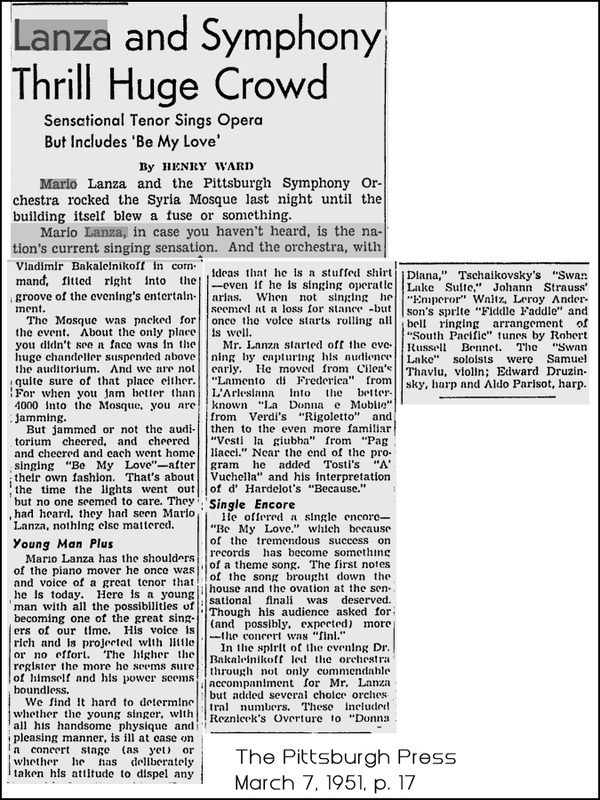 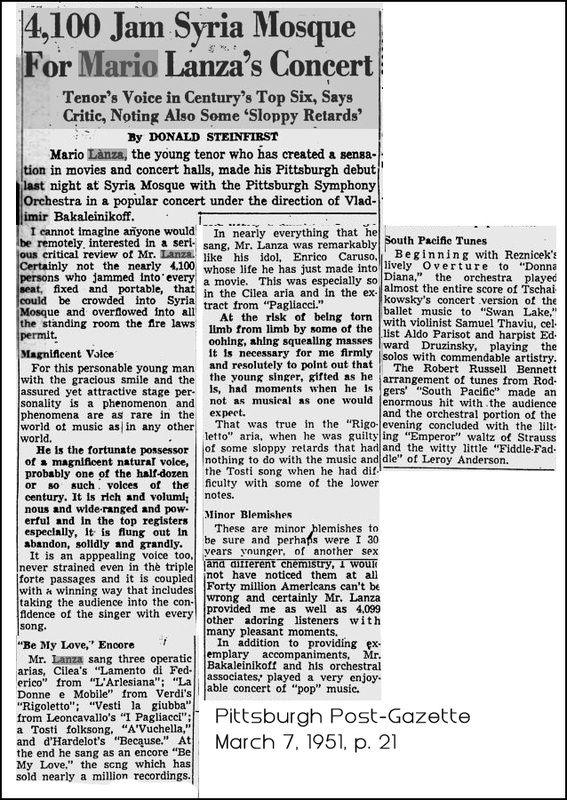 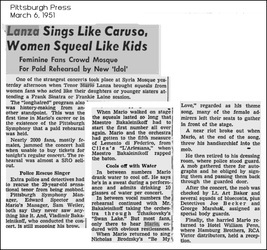 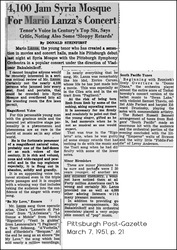 Such was the demand for tickets, in fact, that even Lanza's afternoon rehearsal with the Pittsburgh Symphony on March 6 was opened at the last minute to the public, who promptly snapped up two thousand tickets, while in Utica, Armando Cesari writes, "the police let in groups of 25 at a time as standees in the doorway to hear a single number" (Mario Lanza: An American Tragedy, p. 139). 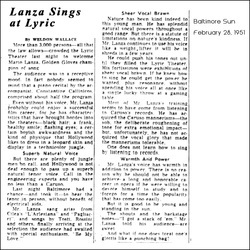 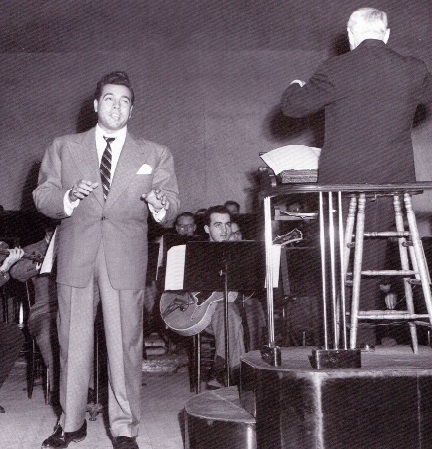 Time and Variety both reported that the tour (which was to be Lanza's last for seven years) was the most financially successful of any solo operatic artist in history. 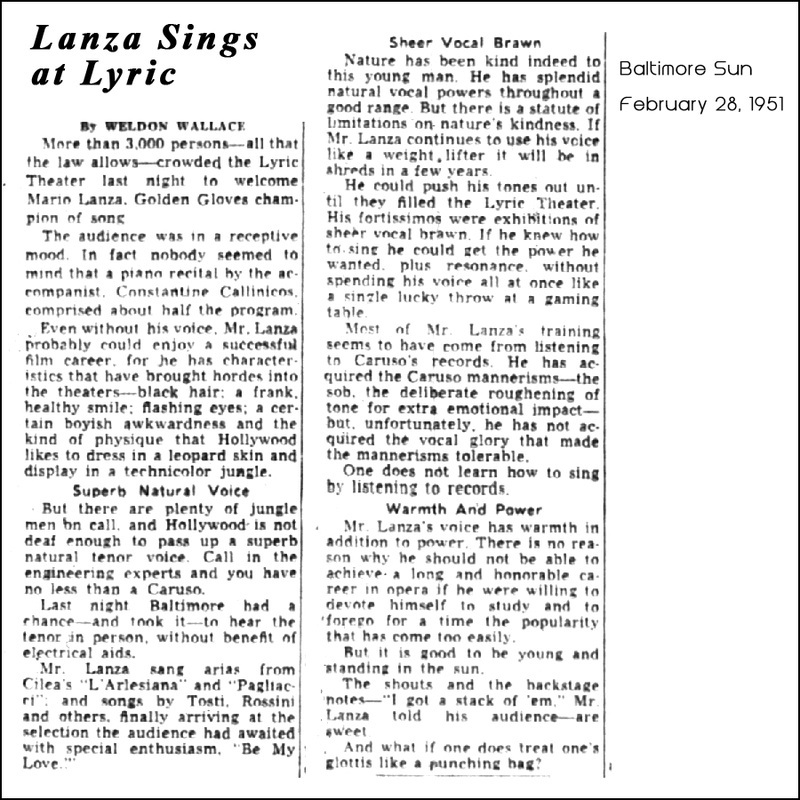 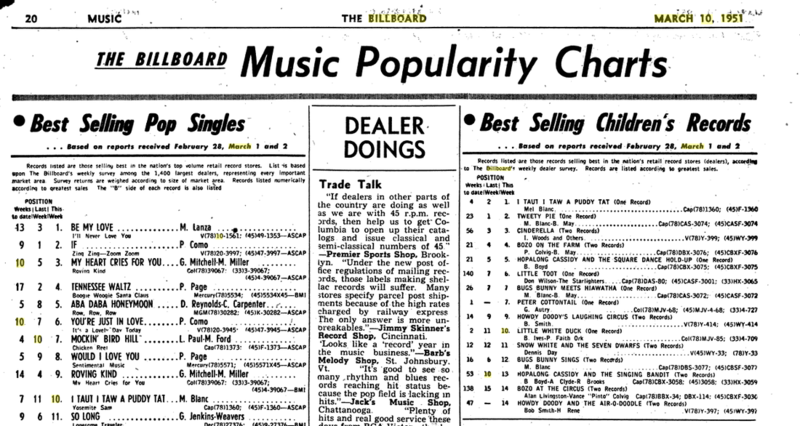 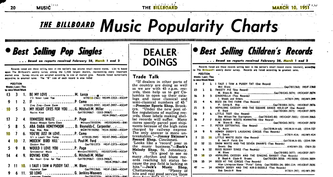 Its popularity was no doubt assisted by the public's enthusiasm for Lanza's recently released recording of "Be My Love," which reached the number one position on Billboard's popular chart four weeks after the tour had begun (see below)—the first (and only) time an operatic singer had achieved such a feat. 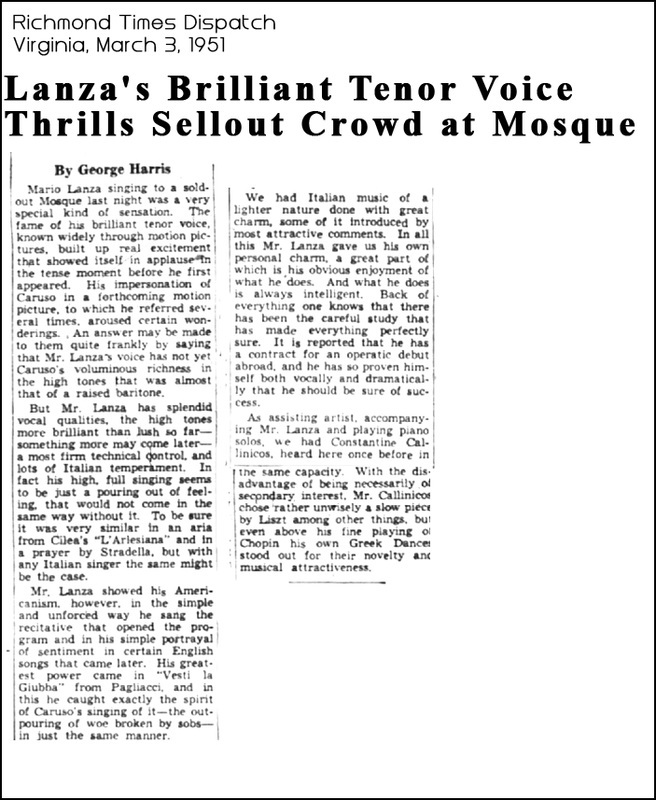 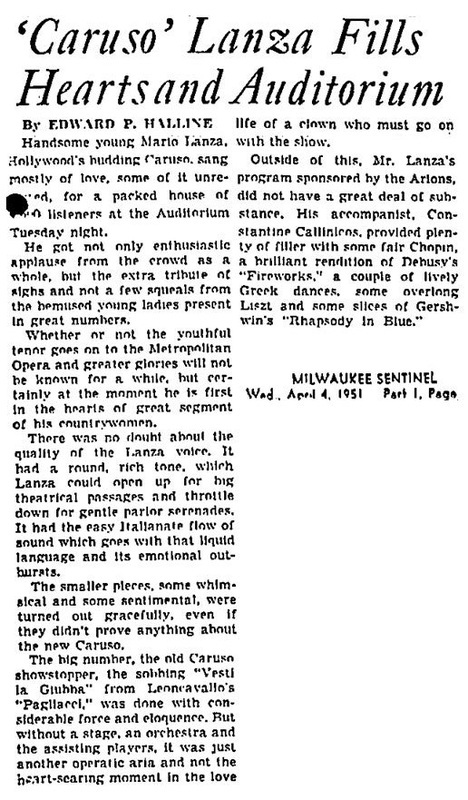 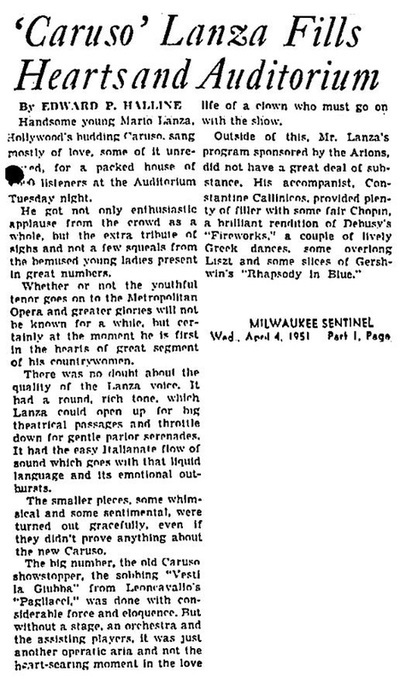 But while audience reaction to Lanza's singing throughout the tour often bordered on the hysterical (Cesari, 141), critical reaction was decidedly mixed, with some of the more demanding reviewers, such as the Chicago Sun Time's Felix Borowski, taking the tenor to task for his perceived stylistic lapses. 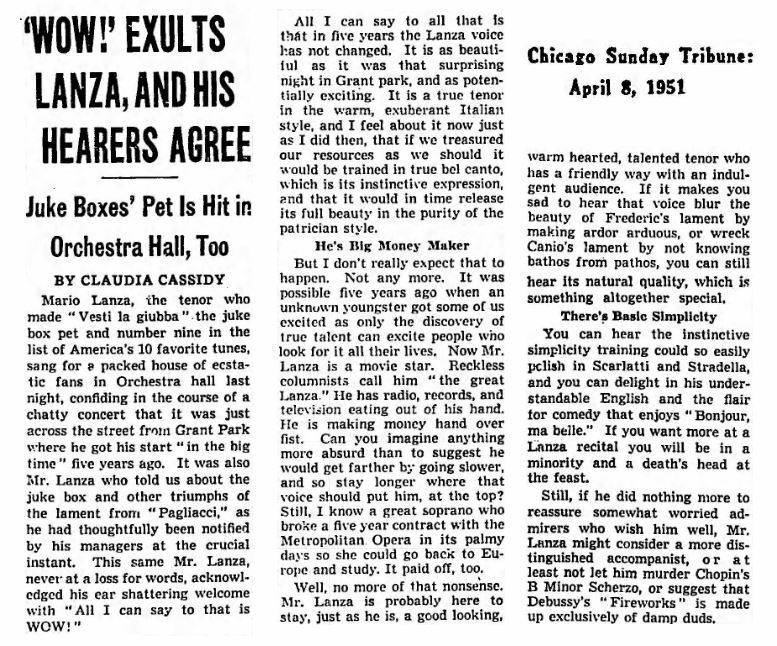 Borowski's Chicago colleague Claudia Cassidy, who had written glowing reviews of Lanza's concerts in the same city four and five years earlier, also criticized some of the tenor's interpretations at the recital, but tempered her misgivings with the acknowledgement that "the voice is as beautiful as it was that surprising  night in Grant park, and as potentially exciting" (see below). 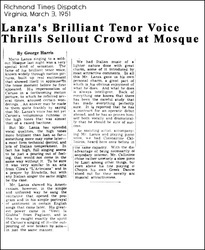 In any event, she added, "If you want more at a Lanza recital you will be in a minority and a death's head at the feast." 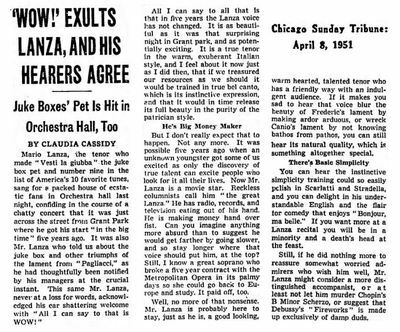 Interestingly, both Borowski and Cassidy reserved their harshest criticism for Callinicos, with the former accusing the pianist of "pounding . 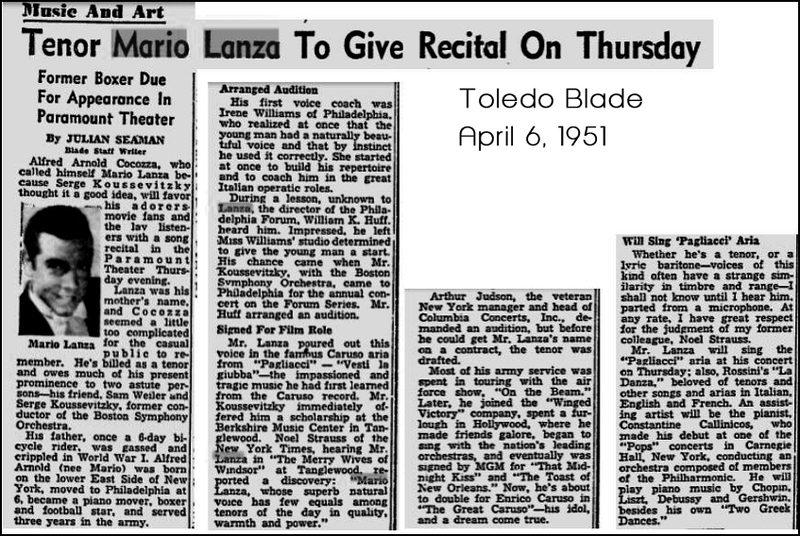 . . his innocent instrument," while the latter urged Lanza to consider to replacing his accompanist, "or at least not let him murder Chopin's B Minor Scherzo."